The 2017 Australian Open final will be contested on Saturday between the number two seed, Serena Williams and the number 13 seed, Venus Williams in the first all-Williams Slam final since 2009. This year’s Australian Open has produced wave after wave of absorbing storylines; in the first of the semi-finals, Venus Williams defeated CoCo Vandeweghe in three sets, 6-7(3) 6-2 6-3. CoCo was one set away from reaching her first Slam final and looked in great shape. The 25-year-old was so aggressive from the baseline, forcing Venus into defence, and secure at the net too with some gorgeous volleys. One thing that really hit me during this match was how much CoCo’s movement has improved over the years. Venus managed to halt CoCo’s momentum in the second set with her serve being the crucial factor in the sea change. The use of the body serve was a tactic that worked well throughout the match but she really went for her serve on the big points from the second set onwards. Venus saved all seven break points that she faced in the second set and this coupled with more and more errors from CoCo’s side saw the match go the distance. Venus was in the ascendancy at the start of the third set as she scooped the early break. Venus saved more break points in her first service game which was in fact the fourth service game in a row in which she managed to fend off break points and hold. CoCo scored a pair of gutsy service holds herself from *0-30 down midway through the set but Venus didn’t waver, breaking for the win on her fourth match point. Venus’s celebrations were absolutely delightful to watch. This is an incredible accomplishment considering everything she has been through after she was diagnosed with Sjögrens Syndrome back in 2011. I’d lost count of the number of times I had read negative things about Venus after a loss and why she would continue to play on. Today, and in fact, everything she has achieved over the past few years, demonstrates the futility of the debates. Venus is an inspiration and the way she competes on court is a shining example to the next generation of tennis players. It must have been difficult for Serena to focus on her match, knowing her sister had made it to the final, but she delivered in the second semi-final with a calm and measured display to overwhelm a sluggish, Mirjana Lucic-Baroni, 6-2 6-1 in just 50 minutes. Lucic-Baroni spoke in her press conference about feeling a step-slow but, as classy as ever, she gave all the credit to Serena. The American’s serve has been erratic at times but she produced some of her best stats of the tournament so far; Serena served at 68% first serves in and dropped just two points behind it. At the end of Saturday, the Williams sisters will have 30 Grand Slam singles titles between them. Head-to-head record: Serena leads the head-to-head, 16-11 and has won seven of their last eight matches on tour. Venus’s last win came in Montreal in 2014, a come-from-behind win in the semi-finals, 6-7(7) 6-2 6-3. Their most recent match was at the 2015 US Open where Serena prevailed in three lopsided sets. In hard court matches, Serena leads 10-8; in Slam finals, Serena has won six of their last eight. Interesting stat: After going three years between 2012 and 2014 without reaching the second week of a Slam, Venus has since posted a super record by reaching the last 16 at seven of her last nine Slams. Serena’s stats are even more impressive as she has reached at least the semi-finals of her last 10 Slams. Final thoughts: Serena and Venus playing against each other in any match, let alone a final, got me thinking today about the emotions of the occasion for the pair. I was beginning to imagine how it would feel to play my brother in such a situation. I got quite excited for a moment about the prospect of us playing the Wimbledon final until my brother told me to slow down 😂. Still, it got me thinking about how difficult it must be to see someone you care about so much on the other side of the net in your way of creating history. It’s been a very favourable draw for Venus but she deserves credit for taking advantage of it – she has only had to play one seed in Anastasia Pavlyuchenkova, and dropped just the one set along the way. Serena’s had a pretty dicey draw and while she hasn’t played anywhere near as impressively as she did to reach last year’s final, the world number two has looked mostly in control of her game and is still yet to drop a set. Serena started strong against two tricky opponents in Belinda Bencic and Lucie Safarova, and then raised her level significantly in her most challenging match of the tournament against Johanna Konta, keeping it up for the semi-finals too. There’s so much on the line with this match – Serena goes for Slam title #23 as she attempts to inch clear of Steffi Graf. Venus is into a first final in Melbourne since 2003 and is seeking to win her FIRST Australian Open! It’s impossible to know how both Serena and Venus will deal with the occasion of playing each other in a Slam final, particularly as it has been quite a while since they’ve been in this position. Based on their respective form and head-to-head, i’m leaning towards Serena, but the fact that we will get to witness this match-up again in a Slam final is going to be a very special moment. ← Thursday’s Set Points, Australian Open 2017 Day 11: Rolling back the years, a Serena-Venus final! In any other situation, I would root for Serena but I hope Venus wins. 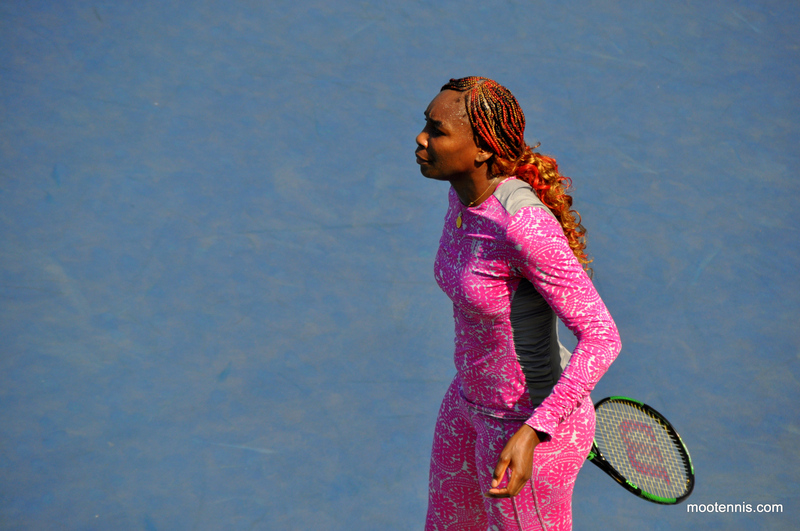 It will be a tall task for her, but if Serena makes a lot of unforced errors Venus has a chance. I will be happy for who ever win. Kerber and Muguruza had an easy draw until Coco took them out. The bottom of draw was heavy and of course 4 top players were missing, so to point out Venus had an easy isn’t fair when the whole top half was easy. Venus had a tougher draw than Kerber and Muguruza. Even though I love the Williams sisters, I generally don’t like their matches against each other. While I do not believe there is any “fixing”, I do feel like the sister who needs the win less usually doesn’t display the vitriol they would bring against a different opponent in that position. The interesting aspect here is im not sure which sister will feel they want it more. Serena chasing history and #1. Venus chasing history also though, and it’d be a great comeback story (even if she was top ten last year). My heads saying Serena wins but my heart is saying Venus does it. I said I don’t believe they fix matches, so take your brand of crazy elsewhere. The point of a prediction is to state it *before* the event happens. Not afterwards.